Through non-invasive means, we are transforming and personalizing the treatment of cardiac arrhythmia. Although better patient care starts with evidence-based treatment planning, the current AF classification system does not relate AF stages to the extent of the enhancement or map to clearly defined treatment options. 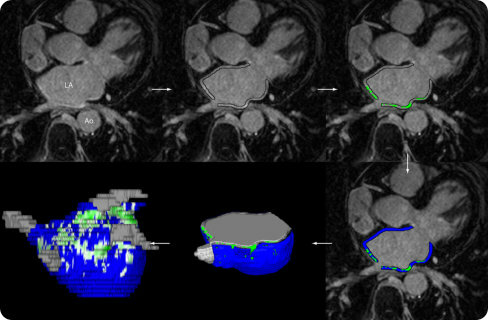 Merisight Image Analysis can help physicians address this shortcoming by providing unique insights into patients’ underlying atrial enhancement, using LGE-MRI pulse sequences and optimized MRI acquisition settings developed by MRI physicists from the University of Utah CARMA Center. Tools used in the Merisight service incorporate groundbreaking algorithms for 3D image processing and volume visualization to produce detailed models of patient heart structures. It quantifies the extent of the enhancement in the left atrium and computes the amount of AF progression into one of four stages, as defined by the Utah Classification, based on DECAAF research. Physicians can use this individualized information to plan AF management and ablation strategies and develop personalized treatment plans for patients with arrhythmia.